I’ve created a list of my favorite 8 new technical features, my “gems”. In this series of posts, I will show you them and dive a little bit into their technical details. 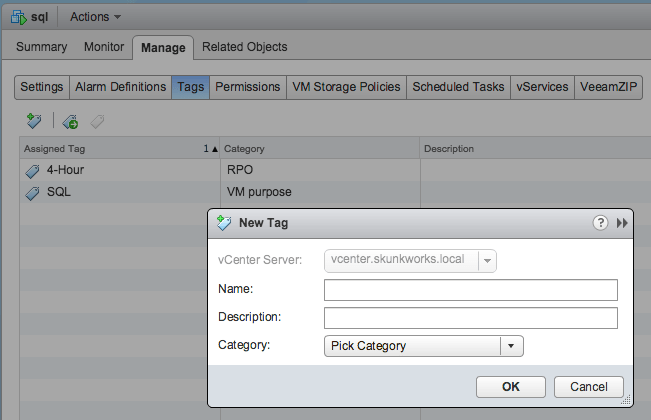 In this fourth episode, we will talk about the support for vSphere tags. For example, you may want to leverage the new v8 SQL Server transaction logs backup functionality for your most important SQL Servers. 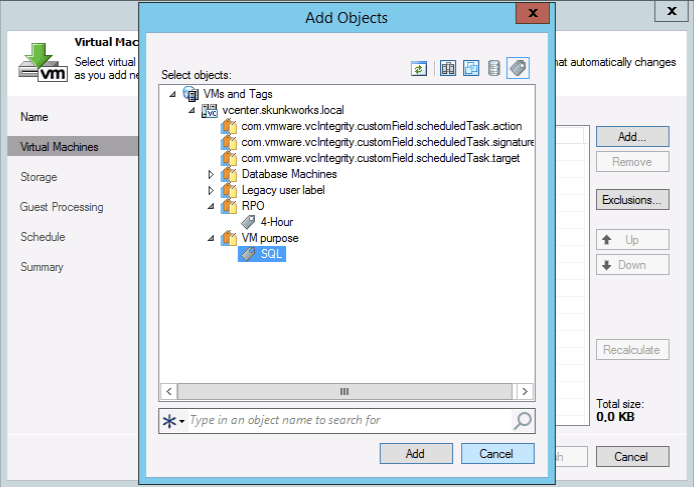 You configure a backup job to include all virtual machines with “SQL” tag with the Logs Backup option configured to backup transaction logs every 15 minutes, and then you just tag your important SQL servers virtual machines with the “SQL” tag. By using this setup, each tagged SQL Server will be protected with the RPO of 15 min or less automatically. Another example: your security policy requires all servers belonging to the Finance department to be saved in encrypted backups. You don’t want to encrypt all your backups, just this one. You can create a new backup job where encryption is enabled and configured, and then you simply select the tag “Finance” in the “Department” category as the dynamic scope of virtual machine selection. All virtual machines with this tag will be protected by this job, and the backup files will be encrypted. And last example: you have some virtual machines you want to replicate in your Disaster Recovery site every 4 hours. Tags are supported in Replication jobs as well, so again you create a Replication job populated with a “4 hours replication” tag, and the job will automatically pick up the virtual machines tagged with the corresponding tag. The beauty of tags is that they are truly dynamic in nature, and so are queried each time a job is executed; in this way, each virtual machine that was just tagged is immediately added to the correct job without any job editing required. Say you have two tags like “24 hours RPO” and “4 hours RPO”: with the former you select virtual machines that are saved once a day, and with the latter machines that are saved every 4 hours. After some time, your company realizes that a virtual machine has become too critical to be protected with a daily backup. By simply removing the former tag and applying the latter, immediately the virtual machine starts to be protected with the job running every 4 hours. And all of this without ever modifying any backup job that you initially created. 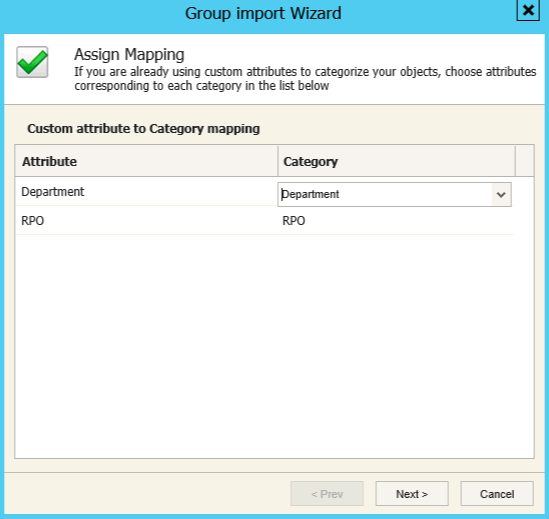 And if you already have used extensively vSphere tags, there’s no reason to do the job twice: Veeam ONE has a wizard to map tags created in vSphere to corresponding categories and groups in Business View. 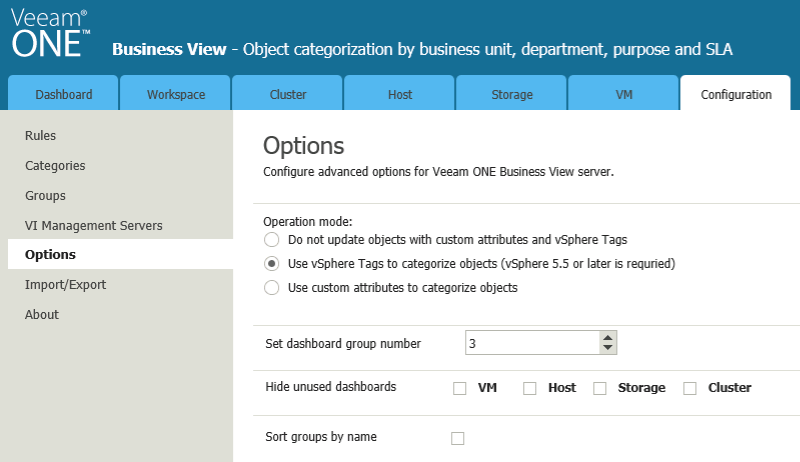 Thanks to vSphere tags integration in both Veeam Backup & Replication and Veeam ONE –regardless if you are a service provider, or your department is acting like an internal provider for your different lines of business, you can now offer advanced data protection services, with also proper separation of duties. Data protection administrators can setup and manage policies, while application owners can independently decide the best policy for their workloads.